Blowout Sale! Save 59% on the Krator BFR027-B Black Rest (Front Yamaha YZF R1 R6S FZS 600 TDM 900 XJ Diversion Motorcycle Foot Pegs Left and Right), by Krator at Two Wheel Tek. MPN: BFR027-B. Hurry! Limited time offer. Offer valid only while supplies last. These Black Foot Pegs are the perfect replacement for your stock OEM ones. These footrests are 100% brand new and are made of high quality Aluminum. 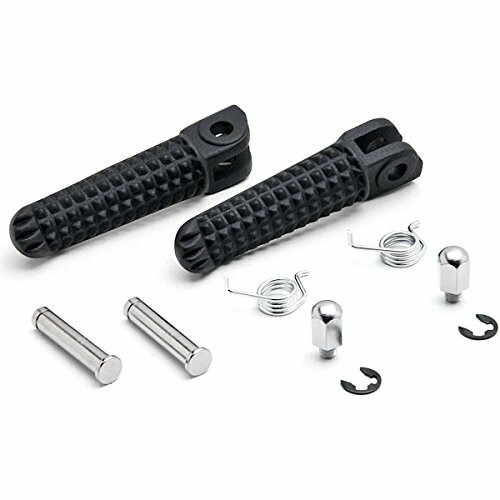 These Black Foot Pegs are the perfect replacement for your stock OEM ones. These footrests are 100% brand new and are made of high quality Aluminum. Features: High Quality Footrest Pegs (Left & Right Sides)Easy installation! No additional hardware : High Quality Aluminum Alloy Location: Front Footrests Color: Black Condition: 100% Brand New Fitment: Yamaha YZF R1 1998-2011 (Front)Yamaha YZF R6 1999-2014 (Front)Yamaha YZF R6S 2003-2009 (Front)Yamaha FZS 600 1998-2004 (Front)Yamaha TDM 900 2002-2009 (Front)Yamaha XJ 600N XJ 600S 1994-2003 (Front)Yamaha XJ 900S Diversion 1995-2003 (Front)Yamaha XV 1700 PCR Road 2003-2005 (Front)Yamaha FJR 1300 2001-2005 (Front)Yamaha BT 1100 2002-2006 (Front)Yamaha MT03 2003-2006 (Front)Yamaha TDR 125R 1993-2003 (Front)Package Includes: 2x Foot Pegs (Left and Right)Pins and Hardware Included Instructions not included.